Cintsa On The Beach - Cintsa (Chintsa) Accommodation. The Beach house is situated on the river with magnificent uninterrupted views of the ocean, river and beach. One of the best sites Cintsa East has to offer. The house is with-in one minute walk to the ocean or just stroll down to the bottom of the garden to the beach. This accommodation is ideal for three families holidaying together but need your own space and privacy. There are 3 separate units with one common entrance. You can leave the unit doors (entrances to separate units) open and it becomes one house - with 3 kitchens, 4 lounges, 8 bedrooms, 7 bathrooms, a separate toilet (sleeps 19). Close the door to your unit and it is totally private and equipped with every convenience. (4th unit available). Spectacular views from 2 lounges, 2 bedrooms. 4 Bedrooms - 2 King size beds - both with en-suites, 2 doubles - one has a single in it (sleeps 9 in total). 3 bathrooms, 1 separate toilet. Open plan fully equipped kitchen with large kitchen / bar area - all appliances and utensils with separate scullery/laundry (washing machine, tumble dryer) 2 large fridges. Large deck with Weber barbecue, built in Jacuzzi, patio furniture and sun loungers. 2 bedrooms and 2 lounges lead onto large deck. Percale Linen and bath towels provided. Spectacular views from lounge and one bedroom which leads onto a large deck. 3 bedrooms - 1 King en-suite, 1 Queen en-suite and 2 bunks beds in one room - (sleeps 8). One large comfortable lounge with built in barbecue, pool table, and dartboard, bring your own darts. Open plan kitchen, fully equipped with all appliances and utensils (washing machine, tumble dryer, dishwasher, microwave etc). There are 3 bathrooms, 2 en-suites - one with a full bathroom, and full 3rd bathroom. 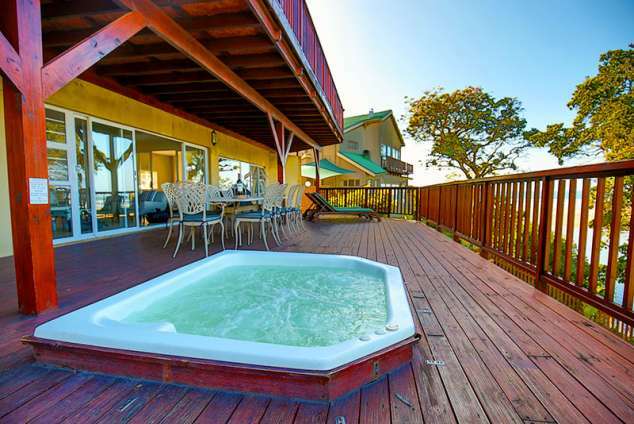 Large deck offers outdoor furniture and sun-loungers, Weber barbeque and a Jacuzzi on this deck. Spectacular views from the bedroom, lounge and deck. 1 large bedroom - King-size bed - full en-suite bathroom. DSTV B+B package, built in fire place - leads onto large deck with Weber braai, patio furniture and sun-loungers. Open plan fully equipped kitchenette. There is a 4th fabulous unit with a small balcony overlooking the garden which accommodates 2 people plus a sleeper couch. Separate entrance but can also lead into unit 2. There are 2 doors down the passage separating it from unit 2. DSTV B + B package. This unit is available on request. The house is 8 to 9km from a game farm with restaurant , within walking distance to a Coffee Bar and a Pizza Restaurant and bar. 3 up-market restaurants - easy walk to 2 - one is about 1 km up the hill. There is a shop 300 meters away and a Spar shop approximately 20km away. 132938 page views since 04 Nov, 2004. Last updated on 24 Jan, 2019.